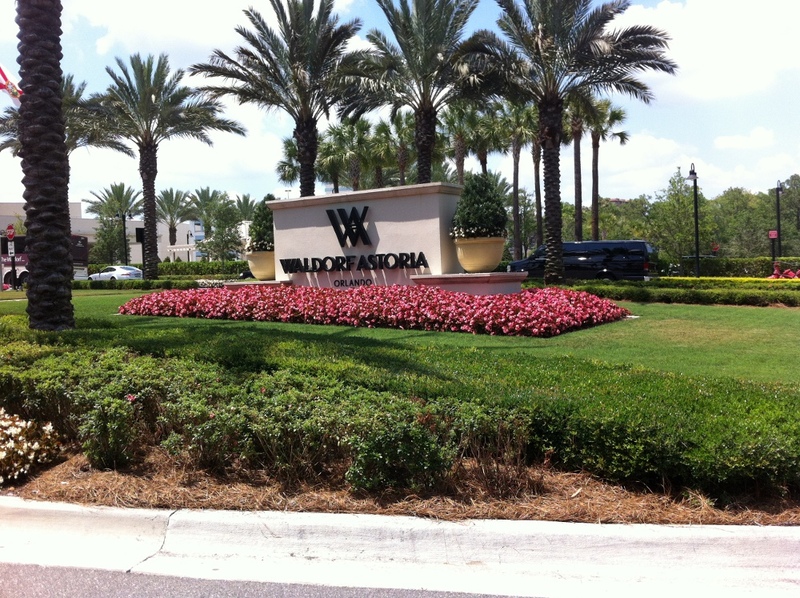 Waldorf Astoria Orlando, A Deluxe Experience! 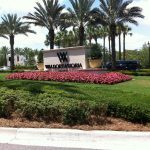 Home » Florida Vacations » Florida Top Destinations » Press Release » Waldorf Astoria Orlando, A Deluxe Experience! 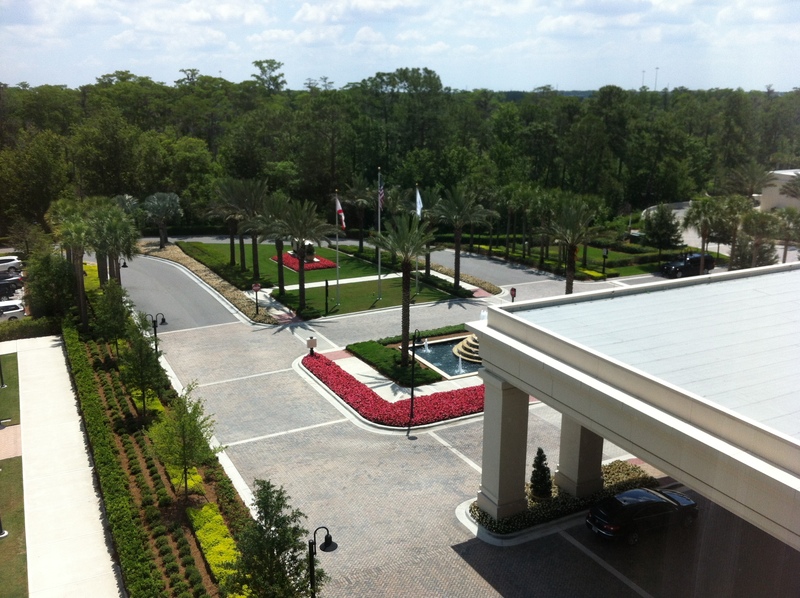 There are many lovely hotels in Orlando as it is a tourist destination based on the many attractions it has to offer. 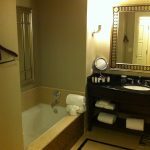 I have a few favorite hotels in Orlando which I have stayed at such as the Gaylord Palms and the Peabody and I will be adding the Waldorf Astoria Orlando to my list. My husband decided to surprise me with a getaway to the Magic Kingdom for my birthday and as fate would have it the Gaylord Palms was booked for a big convention and had a five day minimum so my husband decided he was going to find a hotel I had never stayed at and selected the Waldorf Astoria. I first heard of the Waldorf Astoria as a child in the famous movie starring Eddie Murphy entitled coming to America. The movie set in New York left a lasting impression upon me as the King of Zamunda (played by Earl Jones) Eddie Murphy’s father in the movie selected the Waldorf Astoria to reside at as he visited America for a short while as he searched for his son. My husband new of the fine reputation of the Waldorf Astoria because he grew up in New York and hoped to exceed my expectations and he did. 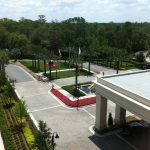 The Waldorf Astoria of Orlando is very close to Animal Kingdom and several other themed parks which was another reason my husband decided to select it. We arrived at the hotel at 1:30 a.m. in the morning as we decided to visit Disney World Magic Kingdom first. When we first drove up to the hotel it was nice but I was not blown away by its appearance on the exterior. There was no self parking so we had to valet. The valet staff at the hotel was extremely professional and courteous and we were immediately attended to and assisted with our luggage. We checked in at the front and were escorted to our room by a very friendly bellhop. The room was very spacious and luxurious with double beds. 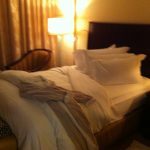 There were matching bath robes lying on top of the bed and plush slippers welcoming us upon our arrival. They were a pair of dark chocolates on the night stand beckoning us to indulge. The room was very classically decorated. The bathroom was my favorite with a modern frameless shower and tub. 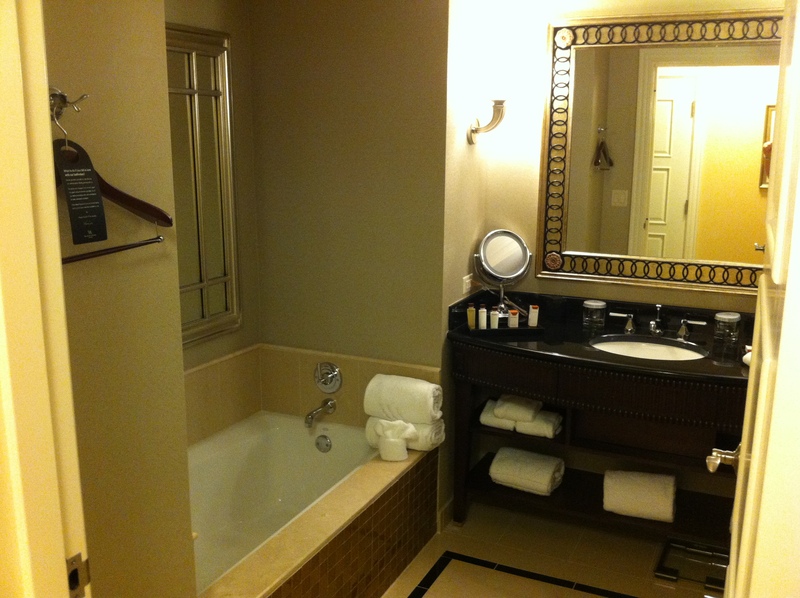 The bathroom also had a scale which is found in very few hotels as an extra amenity. restaurants within the hotel had closed for the night. So we decided to order room service. We ordered two beers and a 12 inch made to order Pepperoni Pizza which was not on their menu. Our order was delivered in less than 20 – 30 minutes. The waiter that delivered the food was very courteous and took great care of us. The pizza was delicious the beer was cold and the complimentary chocolate chip cookies made the midnight snack outstanding! 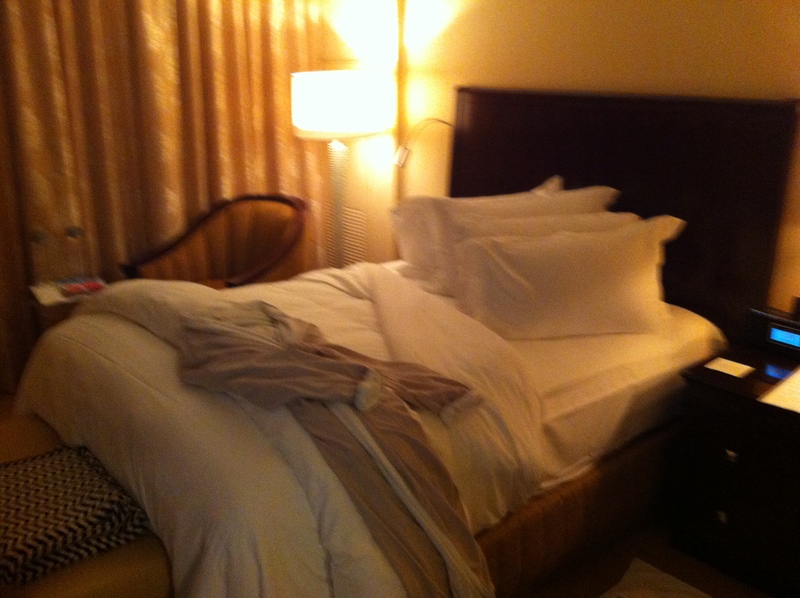 The Beds in the room were plush yet firm with down comforters that fostered a restful sleep. We requested a late check out and left the hotel room at 12 noon. We decided to dine at Oscars one of two Restaurants within the hotel. The other Restaurant is called Bear and Bull and is usually reservations only. At Oscars I ordered tomato soup and a Panini sandwich with Mozzarella, Basil and Prosciutto which was scrumptious. My husband ordered the famous Waldorf Salad which was invented by the Waldorf Astoria New York along with, as we discovered, Thousand Island dressing and Red Velvet Cake. My husband also ordered a Burger with fries which was very tasty. We finished off this great meal with Red Velvet Cake which is the best I have ever tasted in my life and is a must try! We retrieved our baggage from the bellhop and valet brought our car around and waived goodbye to the hotel as we were off to swim with the dolphins at Discovery Cove! As we entered our vehicle the staff invited us to come back which left a very ‘family feeling’ that warmed our hearts. I would definitely recommend this hotel to all my friends and family as we enjoyed our stay at the hotel and the service was impeccable! The Waldorf Astoria remains passionately devoted to the well-being of each and every guest and exceeded my expectations as a guest. Truly one of the best hotels I have had the pleasure of staying at, and for golf lovers the Waldorf Astoria features a Rees Jones designed Championship Golf Course!